Lt.Cdr Abhilash Tomy is to get a heroic welcome from President Pranab Mukherjee, the Supreme Commander of the Armed Forces. 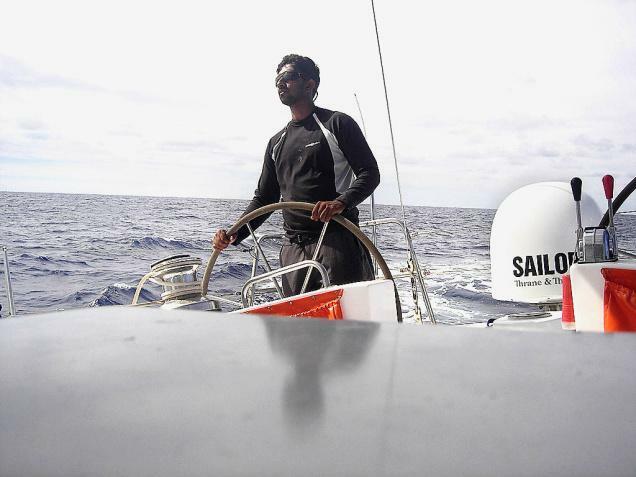 After completing a non-stop solo circumnavigation around the globe sailing for 150 days, Abhilash who completed his expedition on 31st March is being credited to be the first Indian to accomplish the feat and add to 80 others worldwide who completed this task. The country is all set to give a warm welcome to Lt.Cdr Abhilash Tomy who completed the non-stop solo circumnavigation around the globe sailing for 150 days. President Pranab Mukherjee, the Supreme Commander of the Armed Forces will receive India's first non-stop solo sailor at the historic Gateway of India, Mumbai. Defence Minister A K Antony, Navy Chief Admiral D K Joshi, Flag Officer Commanding-in-Chief, Western Naval Command, Vice Admiral Shekhar Sinha will be the dignitaries to be present during the occasion which is being organized to receive the 34 year old sailing icon Tomy who accomplished the task circumnavigating in INSV Mhadei. Set to sail on 1st November 2012 from Mumbai, Lt Cdr Tomy would have covered a distance of 22,967 nautical miles without stopping at any port. Hailing from Kandanad near Tripunithura in Kerala, Tomy is being awaited home by his mother, father and family members who have been tracking his journey right from the beginning. After crossing the Cape Leeuwin off Australia, during the time of India's Republic Day, Tomy overpassed the Cape Horn one of the most dangerous points filled with wild winds, rocky shores and strong currents. On 19th February 2013, he crossed the crossed the Cape of Good Hope and started his expectation back to India riding over the island of Madagascar. The world record for fastest non-stop solo circumnavigation is credited under the name of Frenchman Francis Joyon who completed the tast in 67 days in January 2008. During the scary expedition rounding the Cape of Good Hope, Tomy had go pool into the winds at 130 kmph speed which was a dangerous time and a scary experience. The waves rose to about 10 metre high while Tony took calm moments to avoid damage. He would be the first Indian and second Asian to complete such a journey.